Solutions for your challenges today. Scale for tomorrow. At FactSet’s core is data integration. With more than three million client portfolios, two dozen unique content sets, and 850 independent data providers, we are industry leaders in acquiring, integrating, and managing content. In fact, more than half of our global organization is dedicated to data integrity and concordance. This content fuels our analytics across the investment lifecycle, from fundamental stock selection and research to order management, execution, and reporting. Our expansive workflow solutions in an open and scalable platform backed by unmatched support bring you access to the financial data and analytics you need to make crucial investment decisions. We’re committed to providing our clients with the best mix of data available. Our content is high-quality, concorded, and timely. 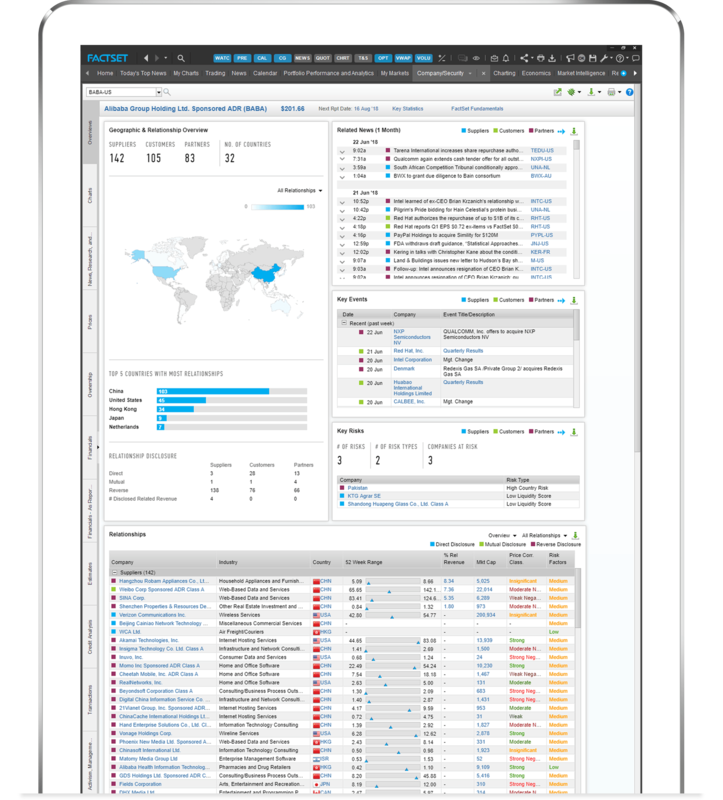 We power your investment lifecycle with leading analytical applications. Our award-winning tools provide more solutions to more challenges. 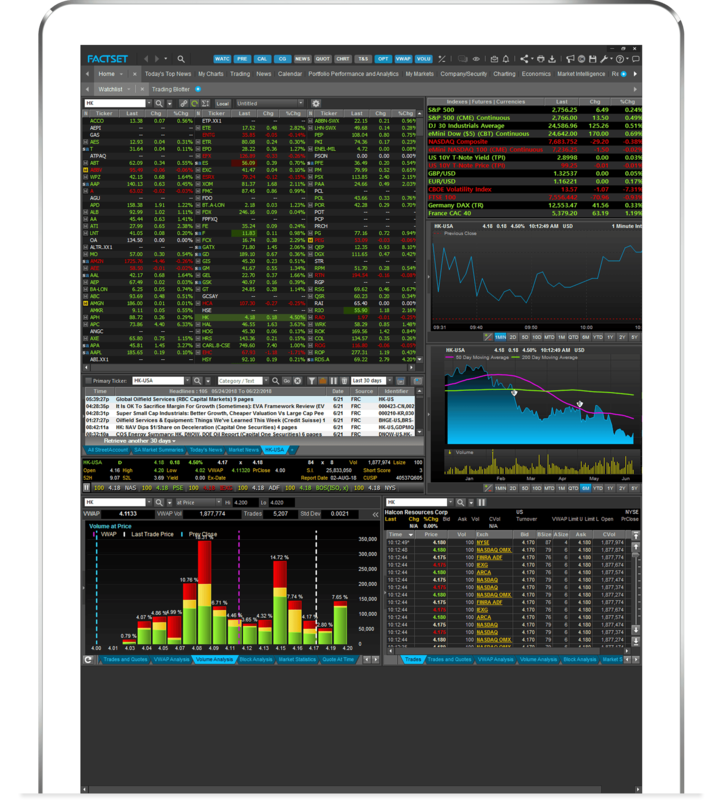 Your FactSet applications are available through desktop software, on your phone or tablet, and online anywhere you have internet access. From raw data to complex calculations, we bring you consistency across a broad range of datasets to enable your system to scale with your needs. We help you find opportunity anywhere and act on openings faster with unique data and an intelligent, predictive system that can help you go from decision to trade first. With faster reporting and automated calculations, FactSet’s full range of risk analytics combines all the data and flexibility you need to examine your portfolio across asset classes and strategies. When you combine robust company and industry analytics with deep market data with FactSet, you can generate first-to-act ideas and opportunities. 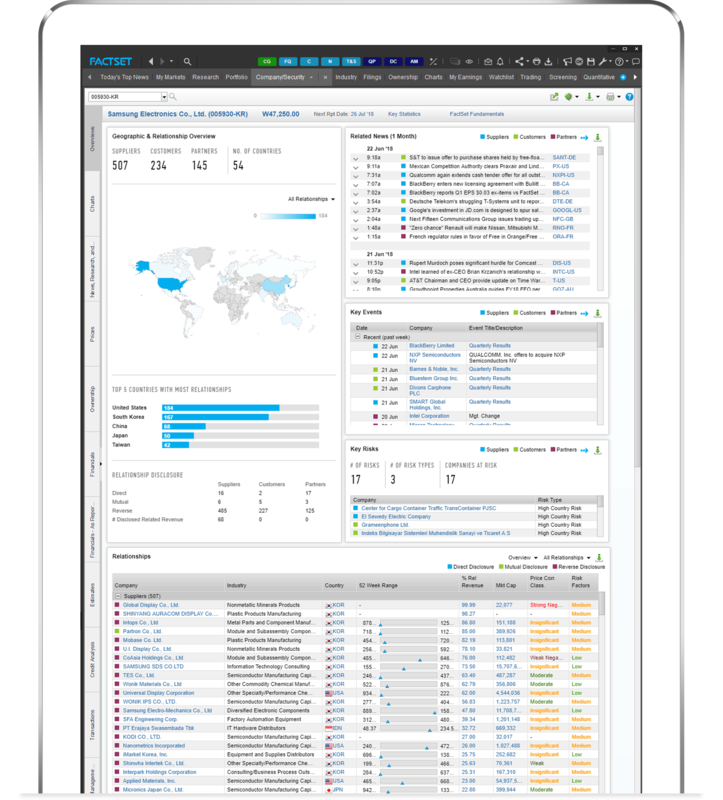 Our trading solutions, powered by Portware, combine the best in OEMS with unique company and portfolio insight to transform the way you discover, decide, and execute. Turn large volumes of data into smart, connected data by exposing direct and indirect relationships and hierarchies between entities, securities, people, and funds. Our regulatory solutions team is staffed with former regulators, regulatory consultants, lawyers, and industry specialists who have helped firms around the world identify and implement effective solutions. Monitor the global markets, research public and private companies, and gain industry-level insight with comprehensive reports that include financials, estimates, debt, ownership information, and more. 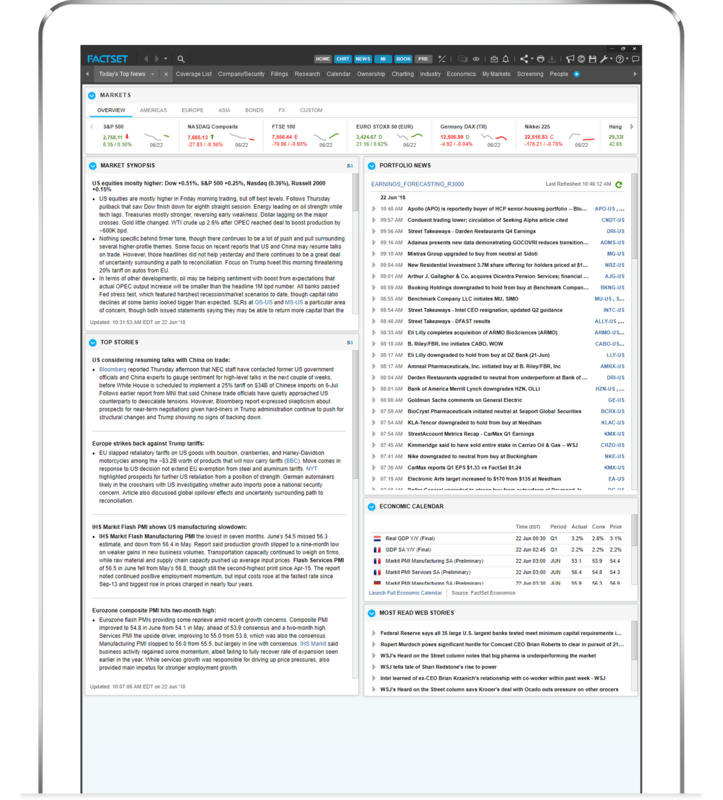 FactSet's extensive suite of analytics let you track individual companies, coverage lists, and industry performance in real time. 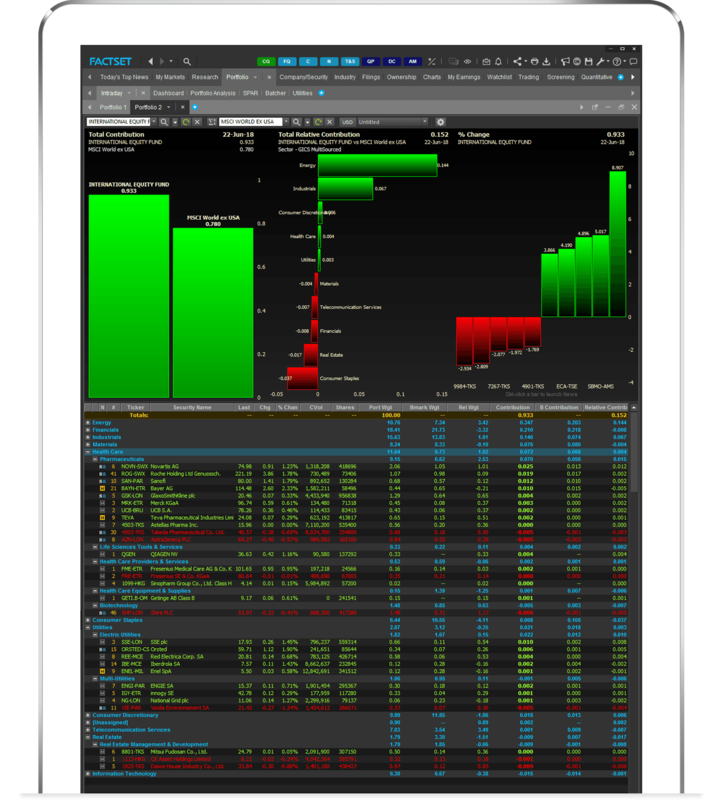 Create custom news and quote alerts, and chart the market data that matters to you. Coverage for an extensive universe of companies and organizations means you'll always have the information you need to follow your investment intuitions. 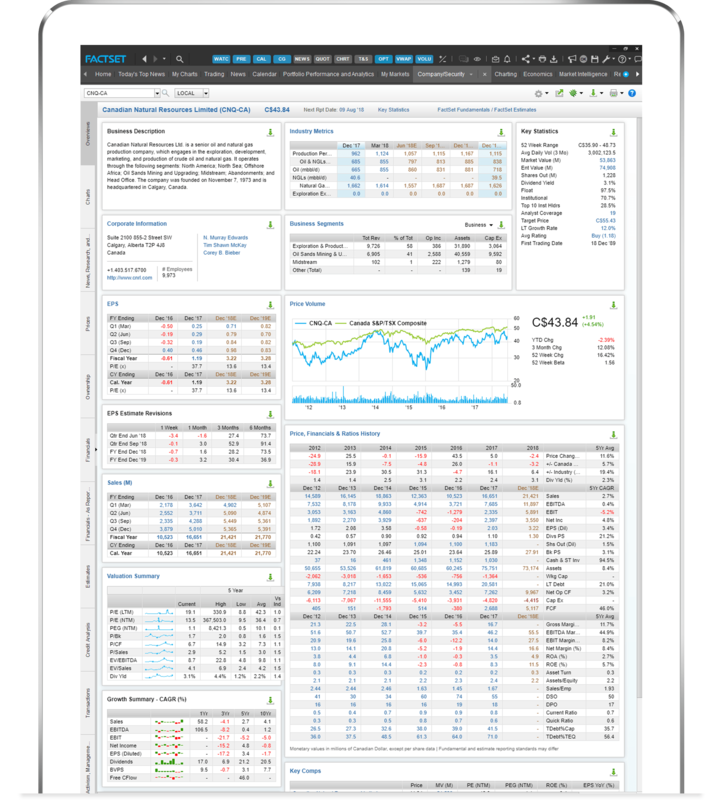 FactSet's integrated multi-asset class portfolio analytics and official performance solutions let you spend more time finding answers and less time managing data. 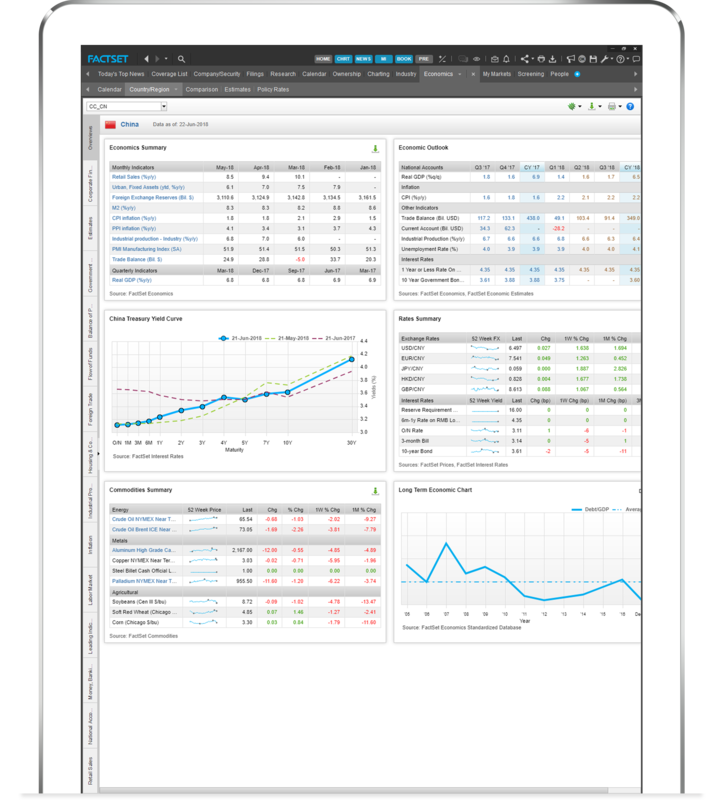 With sophisticated next generation portfolio analytics, performance, and attribution, you get an unparalleled combination of portfolio equity and fixed income analytics, data concordance management, workflow capabilities, and data distribution for internal and external clients. 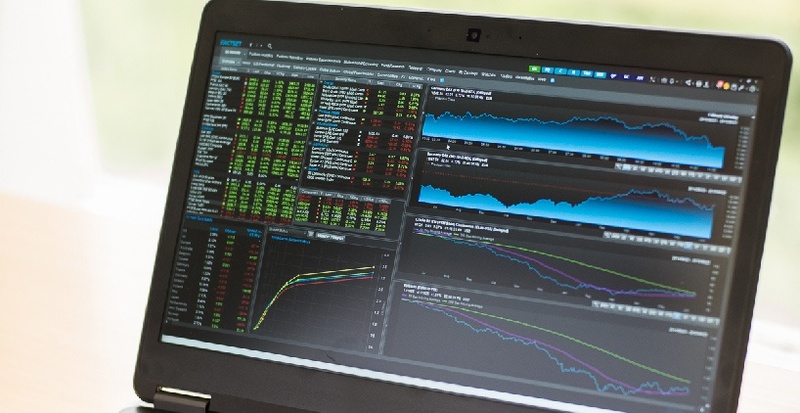 Because proactive trading systems beat reactive markets, FactSet’s fully integrated, multi-asset class order and execution management system (OEMS) leverages predictive analytics to determine the optimal execution strategy for any order in any market environment. Optimize algorithm selection based on your specific order trends via portfolio manager profiling, and watch the EMS learn how to trade like you. When you automate low-level trades, you help your team achieve performance at scale and empower them to focus on more difficult, illiquid, or otherwise sensitive orders. FactSet is everything I need. It elevates my level of confidence when discussing what’s going on in the market. FactSet offers expansive company data to help you make smarter investment decisions. Whether you want to gain a complete understanding of a company's credit strength and overall debt profile, or individual equity components, we can help you understand a company’s true investment potential. Stay ahead with unique alternative data like takeover defense, supply chain, ESG, sentiment, company hierarchy, and more. FactSet leverages best-in-class symbology in unique and alternative data sets to create meaningful connections that unlock new ideas. Access extensive global market data, including benchmarks, economic intelligence, and market aggregates to help you analyze relationships along with risk models, real-time exchange, and pricing data that help you monitor and manage risk. FactSet brings you real-time news on the factors that affect markets and research that pulls in data from many trusted sources. Our curated news service, StreetAccount, is drafted by writers with financial market experience, with news and commentary written in short bullet points that highlight key facts without the noise.